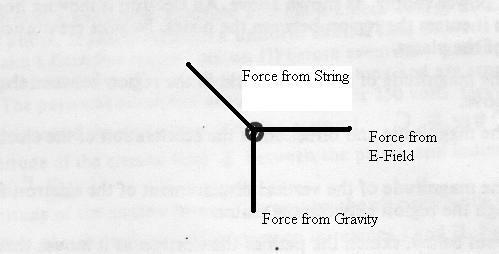 In the space below, draw and label all forces acting on the sphere. Calculate the tension in the string and the magnitude of the electric field. First we take the angle of the string (30 degrees from the vertical), and the cosine of that because we are looking for the hypotenuse. Next we take the adjacent force (remember SOH CAH TOA) which is the force of gravity acting on the sphere. So our equation is cos 30 = ((5e-3)*9.8)/x where x is the force of tension on the string. The tension on the string is .058 N. The second part of the problem, where we calculate the magnitude of the electric field, can be solved by taking the force generated by the electric field and plugging it into the E = F/q formula. Here we are using tan, because we need to find the adjacent force. The string now breaks. 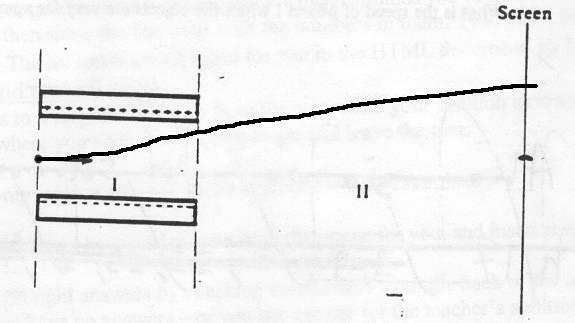 Describe the subsequent motion of the sphere and sketch on the following diagram the path of the sphere while in the electric field. The sphere would move in the same direction it is pointing, the direction that the string is being pulled towards. 2. 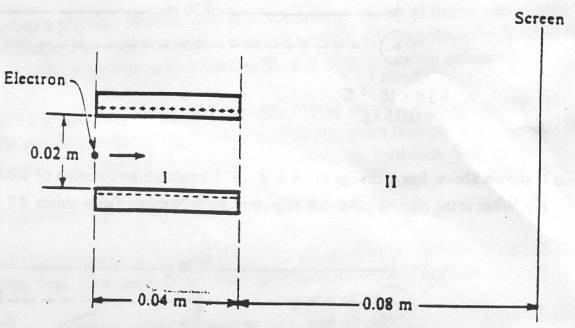 A pair of square parallel conducting plates, having sides of length .05 meter, are .01 meter apart and are connected to a 200-volt power supply, As shown below. An electron is moving horizontally with a speed of 3e7 m/s when it enters the region between the plates. Neglect gravitation and the distortion of the electric field around the edges of the plates. a) Determine the magnitude of the electric field in the region between the plates and indicate its direction on the figure above. The electric field can be found using the E = V/d formula. We take the voltage over the distance between the plates and we get the E field. So, E = 200/.01, so our E field magnitude is 2e4 V/m. b) Determine the magnitude and direction of the acceleration of the electron in the region between the plates. a = (2e4 * 1.602e-19)/ (9.11e-31) = 3.517 E 15 m/s/s our acceleration is 3.5e15 m/s2. c) Determine the magnitude and vertical displacement of the electron for the time interval during which it moves through the region between the plates. d) Sketch the path of the electron as it moves through and after it emerges from the region between the plates. 3. An electron initially moves in a horizontal direction and has a kinetic energy of 2e3 eV when it is in the position shown below. It passes through a uniform electric field between two oppositely charged horizontal plates (region 1) and a field-free region (region 2) before eventually striking a screen at a distance of .08 meter from the edge of the plates. The plates are .04 meter long and are separated from each other by a distance of .02 meter. The potential difference across the plates is 250 volts. Gravity is negligible. b) Calculate the magnitude of the electric field E between the plates, and indicate its direction on the diagram above. c) Calculate the magnitude of the electric force acting on the electron while it is in region 1.
d) On the diagram below, sketch the path of the electron in regions 1 and 2. For each region, describe the shape of the path. 4. Object 1, as shown below, has a charge of 3e-6 coulomb and a mass of .0025 kg. 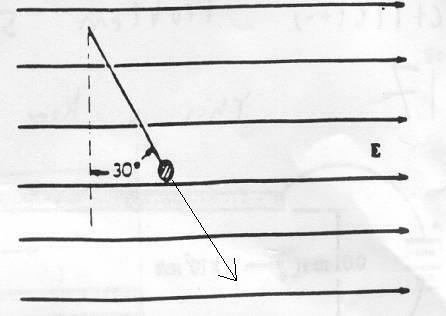 a) What is the electric potential at point P, .3 meter from Object 1? b) Object 2, of the same mass as Object 1, but having a charge of 1e-6 coulomb, is brought from infinity to point P, as shown below. c) How much work must be done to bring the object 2 from infinity to point P? d) What is the magnitude of the electric force between the two objects when they are .3 meter apart? e) What are the magnitude and direction of the electric field at the point midway between the two objects? The two objects are then released simultaneously and move apart due to the electric force between them. No forces act on the objects. e) What is the speed of object 1 when the objects are very far apart?